Dynamax Technologies has released its latest white paper discussing the advantages of location-based visual communications for hospitality industry players. 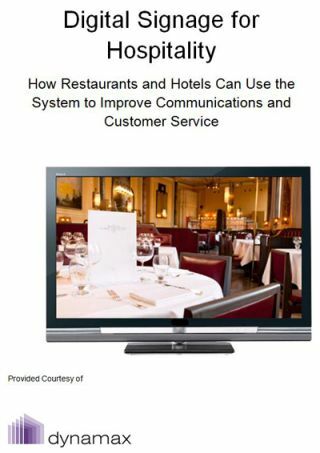 The white paper presents the ways in which hotels and restaurants can use digital displays to develop multi-channel contact points with their stakeholders and improve their bottom line. Hoteliers and restaurateurs are offered examples of when, where and how to use the technology to connect with their guests as well as tips on creating appealing content for this medium. ‘Digital Signage for Hospitality’ presents the main differences between cloud-based and premise-based digital signage systems and provides readers with evaluation criteria for choosing the right solution for their needs. The 28-page document includes references to other resources analyzing the role of technology in hospitality as well as industry-related statistics on the use of digital devices in this environment. The viewpoints of technology and marketing leaders on the emergence of location-based services and cloud-computing complete the discussion. The white paper stresses the importance of multi-channel points of contact for engaging guests in a two-way conversation when they are most likely to respond. It continues by explaining how digital information boards and screens can be used to reinforce other communication channels such as social media or corporate websites, and what role they can play in the marketing and communications campaigns of hoteliers and restaurateurs. ‘Digital Signage for Hospitality’ is available for download from Dynamax’s website.